Most definitely one of the most touching and well executed albums I've heard in recent years. This one really has it all: it's reinterpretation as much as it's innovation, as much as the music gets recomposed, it also gets reconstructed from scratch. 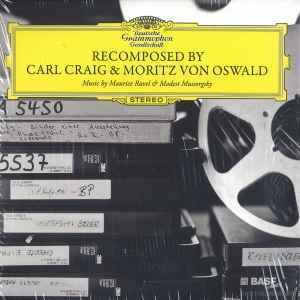 I have listened to other releases where electronic and classical music come together, but the studio chemistry Moritz Von Oswald and Carl Craig have must exceed them all! At places, this even reminds me of Steve Reich's "Music for 18 musicians", because of the way various instruments get added to already existing arrangements, only to get joined by new sound patterns futher ahead. The first beat is actually dropped quite deep into the album, but by that time you'll hardly notice the subtle dubby percussion, as the prchestra has by then already built such a fine hypnotic soundscape, you won't mind the drums at all. After a while the composition becomes more electronic and dub techno orientated, as opposed to the classical music ouverture, but it's the breathtakingly imperceptible transition from the mesmerizing harmonic and organic instruments towards the deep and spacey techno for the living rooms that is flawless. It's as though Ravel's original idea was to include passages of techno music in his work, but he knew no one who could have pulled it off. About forty minutes deep, things go absolutely mad, when a dubby 4x4 beat gets dropped over an eerie, suspense loaded Danny Elfman like symphony, and the outcome is sweet. Superb electronic go hand in hand with live classical instruments like few times before. The albums ends on a superb hypnotic note, just like it started. A looped violin part is played over some tribalish hand drums and those rattle snake effect instruments (I can't remember what they are called at the moment). Bottom line is: if you like either Carl Craig's soulful and melodic Detroit techno sound, or the deep and floating dubbed out wizardry of mr. Von Oswald, you really cannot go wrong here. Ravel's symphony literary draws the best these two have to offer. Modern classical music with a soulful electronic music twist. A superb release, and my opinion is that time will prove it even greater! I really enjoyed this record. The combination of Bolero and the trumpet part from the Samuel Goldenburg and Schumuyle movement in Ravel's orchestration of Pictures at an Exhibition completely blew my mind. As a lover of both Basic Channel and classical music this record does a great job of satisfying both tastes. I would strongly recommend repeated listens to Pictures, both the original for piano and the orchestrated version, to fully appreciate this work.